Four new Spaceworks studios are opening next to the Fulcrum Gallery (at right). Not unlike the gangly adolescent with a grinning mouthful of orthodontia who grows up to become a self-created, self-owning supermodel, the Hilltop in Tacoma has the kind of raw potential that local denizens may someday brag about having “discovered.” It is a transitional neighborhood with breathtaking views, history-rich architecture, an urban vibe and two of the city’s hippest outposts – the Fulcrum Gallery and 1022 South (a bar the New York Times calls “home to some of the most fascinating apothecary cocktail work on the West Coast”). It is also a city sector earmarked for revitalization efforts. Located just a few miles south of downtown, the Hilltop is a happening place waiting to happen. 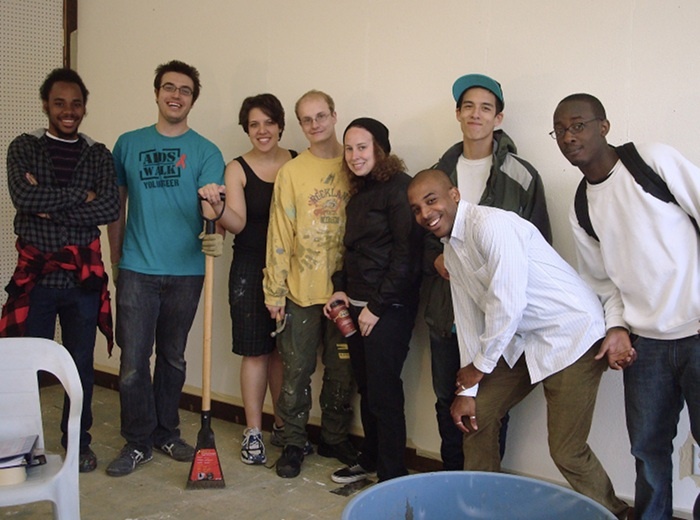 Members of Fab-5 and Toy Boat Theatre have a work party. L to R: Chris Jordan, Josh Bornstein, Jen Davis, Alex Smith, Katie Lowery, Kenji Stoll, Eddie Sumlin, Davon White. That goal may be inching closer: Four vacant retail storefronts on the Hilltop have just been added to the Spaceworks program of exhibition/residency spaces. Located in a building adjacent to the Fulcrum Gallery at 1308 Martin Luther King Way (for years the lone embodiment of the Hilltop “art scene”), the new additions will encourage the critical mass needed to create a more thriving, diverse scene. 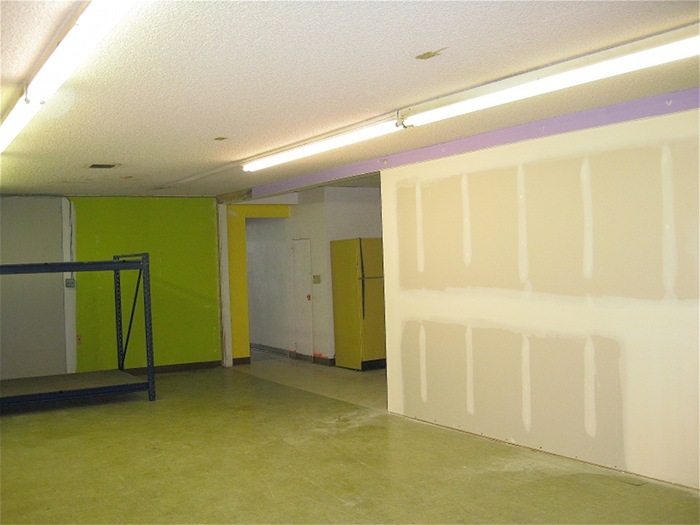 Owned by the Marie Thorp Wilson Trust, the brick building at 1310-1316 MLK Way houses four spacious studios which will be available for three-to-six month terms, rent-free, to Spaceworks participants. It is the kind of open, unfinished project space artists salivate over. The aim of Spaceworks is to enable the creation of dynamic art exhibitions, performances and residencies in urban storefronts, a process which benefits property owners by activating vacant spaces and ultimately making them more attractive to potential renters and buyers. A studio in the making. Trust spokesperson and Thorp family member Jeanette Sorensen is a relative of one of Tacoma’s founding families (her grandfather, Theodore Thorp of Hudson, Wisconsin, followed his cousin, Thea Foss, to settle out West), and says she is a newcomer to the arts. Fulcrum owner Oliver Dorris first floated the idea of opening her building to Spaceworks, she says; then after meeting with the project administrators, “it appeared to be a wonderful program that would give life to our building and an opportunity to help the arts in Tacoma.” Through Sorensen’s generosity, a strip of the Hilltop will become a dynamic point of interest through artistic enterprise. So far, the artists slated for residencies in her building include the Toy Boat Theatre, creative consortium Fab-5 and musician Nate Dybevik. 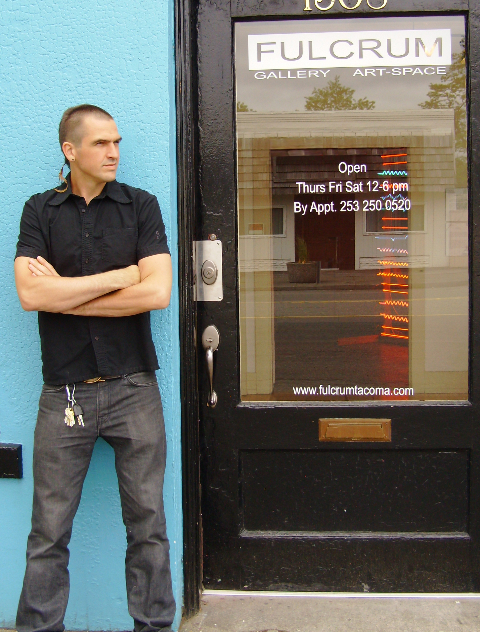 Oliver Doriss - holding the fort at Fulcrum Gallery for four years. Dorris applauds Sorensen’s move as one that will uplift the neighborhood. “I own my building. Jeanette and I are peers in the development of this block. When the Spaceworks thing started I observed a high concentration of spaces downtown and nothing even close to my location….A vacant building is a liability and costs more in insurance, so it’s kind of like having someone on point at the location. I am [expletive] thrilled to have some company on this block! Seriously, the spaces have been vacant for two-plus years.” With the four new Spaceworks properties, “the occupancy on this block just quintupled. It breathes some light and hope into [it]. You know, it is at such a precarious tipping point that it won’t take much to start gaining the momentum needed to grow this neighborhood. Very exciting and a generous use of space…I can feel the wonderful joyful spirit from here ( Gig Harbor).Will drop by on my next Tacoma cruize.Cities are desperately in need of a vibrant exchange of ideas and creativity… if enough people get on board… We can heal this planet!